Want to experience the beauty of nature without giving up the comforts of home? 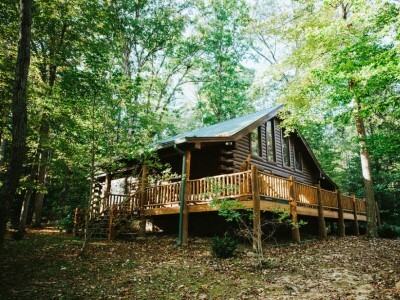 Hilltop Hideaway is the vacation home for you. Located on five acres of rolling hills near Brown County State Park, Salt Creek and the Gatesville Country Store, Hilltop Hideaway’s floor-to-ceiling two-story living room windows offer a glorious view of nature in an intimately private setting. Enjoy the warmth of gas logs from the two-story stone fireplace while relaxing in the oversized, comfy leather couches. Take in the fresh air and breathtaking views from the custom wooden rocking chairs on the covered, wraparound deck. Unwind under the stars in the spacious hot tub and experience nature elegantly. Try a new recipe in the large, open kitchen while enjoying the gorgeous views – or dine outdoors using the gas grill or fire pit. Hilltop Hideaway has it all - so you can relax and enjoy. To keep the cabin pristine, Hilltop Hideaway does not allow pets or smoking. Check-in time is 4 p.m., and check-out time is 11 a.m.